Sailboats on Italian marble coasters. Gorgeous coasters to set your wine, beer, ice tea or favorite beverage on. 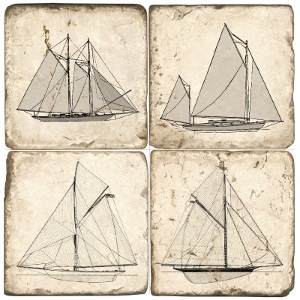 Our sailboat coasters make great nautical gifts for your captain. Coaster Set includes: 4"x 4" Tumbled Botticino Marble Tiles with Cork Backs - Set of Four. Our coastal coasters are made of Italian Botticino Marble, quarried in Verona, Italy. Do the coasters absorb moisture? No, the coasters are made from Italian Marble - just like a kitchen counter top. Our experience with the coasters that do absorb is that after so much moisture, the image begins to come off and then the piece starts to mold. How is the image put on the surface? The image is hand-printed onto the coaster surface. Because the stone is naturally a little porous, the image is absorbed by the surface of the stone. the image will never peel or flack off. How do you clean the marble? The best method for cleaning our coasters is with soap and water. Please do not use any abrasive cleaners or pads, this will scratch the image. Can you purchase the tiles without backs? All of our tiles can be purchased with no backing, just specify this during checkout customer comments. Can the tiles be used for a backsplash? our tiles make beautiful backsplashes. Simply order with no backs, mount to the wall with a construction adhesive, grout and seal.